But remember, to give good advice strategy is even more important than language. Here is some advice about when and how to give advice. First of all, make sure that the person who is talking to you is actually soliciting advice. 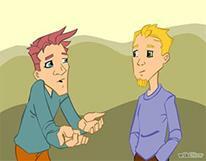 Listen carefully to the person asking for advice. Every situation is unique. Put yourself in their shoes (imagine it is you living their problem in their situation) Think about the consequences of taking your advice Empathize. The other person reaction will not be just rational, but also emotional. Brainstorm to get good ideas Be honest about the good and bad things of your advice Set a good example. If you don’t follow your own advice, nobody will listen to you. Understand that that person may or may not take your advice, it’s their choice. A sentence may be one of four kinds, depending upon the number and type(s) of clauses it contains. An independent clause contains a subject, a verb, and a complete thought. A dependent clause contains a subject and a verb, but no complete thought. 1. A SIMPLE SENTENCE has one independent clause. Punctuation note: NO commas separate two compound elements (subject, verb, direct object, indirect object, subjective complement, etc.) in a simple sentence. A. Independent clause,coordinating conjunction independent clause. B. Independent clause;conjunctive adverb,independent clause. C. Independent clause; independent clause. 3. A COMPLEX SENTENCEhas one dependent clause (headed by a subordinating conjunction or a relative pronoun ) joined to an independent clause. C. Independent, nonessential dependent clause, clause. D. Independent essential dependent clause clause. 4. 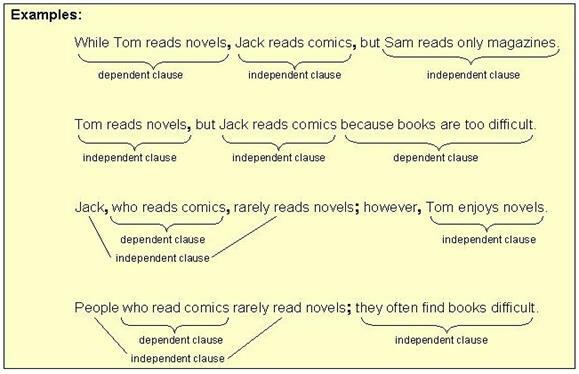 A COMPOUND-COMPLEX SENTENCE has two independent clauses joined to one or more dependent clauses. Follow the rules given above for compound and complex sentences. A compound-complex sentence is merely a combination of the two. 2. Conjunctive adverbs Ic; therefore, ic. 1. Subordinating conjunctions (ADVERB CLAUSE) Dc, ic. or Ic dc. 2. Relative pronouns (ADJECTIVE CLAUSE) I, dc, c.orI dc c.
She said, "Today's lesson is on presentations." "Today's lesson is on presentations", she said. When reporting speech the tense usually changes. This is because when we use reported speech, we are usually talking about a time in the past (because obviously the person who spoke originally spoke in the past). The verbs therefore usually have to be in the past too. "I'm going to the cinema", he said. He said he was going to the cinema. Present simple She said, "It's cold." › Past simple She said it was cold. Present continuous She said, "I'm teaching English online." › Past continuous She said she was teaching English online. Present perfect simple She said, "I've been on the web since 1999." › Past perfect simple She said she had been on the web since 1999. Present perfect continuous She said, "I've been teaching English for seven years." › Past perfect continuous She said she had been teaching English for seven years. Past simple She said, "I taught online yesterday." › Past perfect She said she had taught online yesterday. Past continuous She said, "I was teaching earlier." › Past perfect continuous She said she had been teaching earlier. Past perfect She said, "The lesson had already started when he arrived." › Past perfect NO CHANGE - She said the lesson had already started when he arrived. Past perfect continuous She said, "I'd already been teaching for five minutes." › Past perfect continuous NO CHANGE - She said she'd already been teaching for five minutes. will She said, "I'll teach English online tomorrow." › would She said she would teach English online tomorrow. can She said, "I can teach English online." › could She said she could teach English online. must She said, "I must have a computer to teach English online." › had to She said she had to have a computer to teach English online. shall She said, "What shall we learn today?" › should She asked what we should learn today. may She said, "May I open a new browser?" › might She asked if she might open a new browser. !Note - There is no change to; could, would, should, might and ought to. "I might go to the cinema", he said. He said he might go to the cinema. "My name is Lynne", she said. She said her name was Lynne. or She said her name is Lynne. "Next week's lesson is on reported speech", she said. She said next week's lesson will be on reported speech. "Today's lesson is on presentations." She said yesterday's lesson was on presentations. or She said yesterday's lesson would be on presentations. "How long have you worked here?" She asked me how long I'd worked there. "Iteach English online." Direct Speech She said, "I teach English online." "I teach English online", she said. Reported Speech She said she teaches English online. or She said she taught English online. !Note - We usually use told. For example: Lynne told me (that) she'd never been to China. !Note - That is never used in questions, instead we often use if. I'm British, so I only tend to place the comma inside quotation marks when it's part of the sentence being quoted. "I didn't notice that the comma was inside the quotation marks," Lynne said, "but Hekner did." That said, I read so much American literature, that even I tuck them away sometimes. Really, no one has set in stone what the rules of the English language are. It's a diverse language, and the rules that exist have arisen through usage, and they can change in exactly the same way, so maybe it doesn't matter, but it's best to be consistent. 1. He said, “I have got a toothache”. 2. Manu said, “I am very busy now”. 3. “Hurry up,” she said to us. 4. “Give me a cup of water,” he told her. 7. Raju said, “Gautam must go tomorrow”. 11. ‘I love you,’ he told me. 12. ‘Where are you going?’ James asked Mary. Ex. 1 Turn into reported speech. Ex 2 Turn into direct speech. 1 Mary said she was very tired. Mary said:""
2 The teacher told the boys to open their books. The teacher said to the boys: " "
3 Tom's mother told him not to eat any icecream. Tom's mother said to Tom: ""
4 My friend said that he was going skiing at the weekend. My friend said: " at the weekend." 5 Bob's mates told the teacher that Bob was ill that day. Bob's mates said: "Teacher, today"
6 Mary told Jane she would help her . Mary said to Jane:" "
7 I said I would have bought a new car if I had had the money. I said: ""
8 My father told me to look for a job if I wanted more money . My father said:" "
9 Tim wrote to his brother that their cat had died that day. Tim wrote to his brother: " "
10 The teacher informed the students that the break lasted ten minutes. The teacher said to the students:""
Ex. 3 Turn the following questions into reported speech. 1 "Where do you live?" Mary asked Tom . 2 "How are you going to travel to Italy?" Mary asked Tom . 5 "Who helped you with your work?" Mary asked Tom . I often apologise for the horrors of English spelling, along with my rather frequent apologies for English pronunciation it means I do a lot of apologising, but it's a fact: To speak English well, you need vocabulary, a nice accent, and good grammar. To write English well, you need vocabulary, grammar, an understanding of punctuation and good spelling. Exceptions (sorry): seize, weird, conscientious, conscience, efficient . . .